May | 2014 | Where's Merrill? Considering that this true story is sub-titled a genealogical thriller, and that it is now listed for sale as a genealogy reference book as well as a fictionalized thriller, the reviewer seems to have completely missed the point about Family History research. You cannot choose your ancestors. They are who they were. They are not made-up characters or a figment of a fantasy writer’s creative but far-fetched mind. It took all my willpower to not commit the author’s Cardinal Sin of responding directly to the negative reviewer with my personal feelings about the ridiculousness of their publicized opinion. When you research your own family history, you might start out with a little knowledge about your ancestors’ backgrounds based upon memory or passed-down tales. However, when a genealogist is commissioned to research the ancestry of a complete stranger, possibly from a different country, then no-one can predict where the trail is going to lead. This is what makes genealogy so interesting, and such fun at times, and occasionally and tragically, so very sad. One thing is certain – you cannot manufacture your findings to be “more interesting” than they are. It is also difficult to fathom why my dissatisfied reader finds Merrill to be dull. His researched life story was selected from over 3000 genealogy case histories to demonstrate the surprises that can lurk in anyone’s ancestral closet. 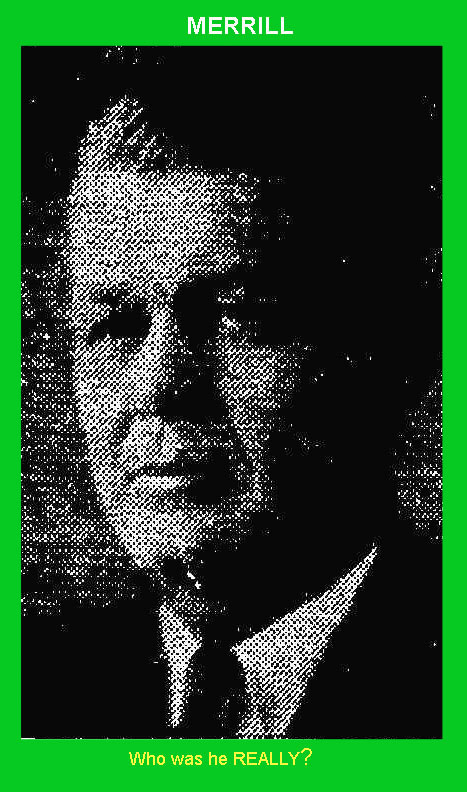 Outwardly, as a young man, Merrill appeared to live a dream life; a successful businessman with a beautiful wife and two children. Then cracks start to appear. Hints at unsavoury vices, violent outbursts and dramatic lifestyle changes creep into the tale. Why? What caused this man to spiral downwards until he just vanished from the planet? And why would no-one talk about what happened? That is what makes Merrill so very, very interesting. It is not fiction. I have no control over the places Merrill resided in or the people he associated with. More importantly, I cannot change who Merrill was related to in a tangled Family Tree inhabited by some very dark characters. Merrill had his good points and his bad points – like us all. No-one should be judged purely on their final chapter. I am always fascinated by the fact that there are still living witnesses in our parish who saw from afar the local town of Tubbercurry ablaze, during a night of infamous terror. This event occurred in October 1920, so our witnesses are aged 100+. There must be something in the South Sligo water because we have more than our fair share of centurions. Obviously, the number of survivors is dwindling yearly – but the tale is etched into the consciousness of all elderly and not so old Tubbercurry natives. Nationalist rebels had been active in South Sligo for 50 years when the Irish War of Independence erupted at the beginning of 1919. Decades of anti-British sentiment saw ordinary Irish men and boys take up arms against their oppressors. Tubbercurry and surrounding districts instantly became a hotbed of secret IRA military offensives. Well-organized small units in each parish soon became masterly at the new art of guerrilla warfare. Constabulary and judicial targets were attacked in surprise overnight raids, and then the IRA soldiers disappeared back to their farms and cottages. The perpetrators were very difficult to distinguish from innocent civilians, thwarting British military leaders who were more used to fighting a visible army. By 1920, a pattern of IRA ambushes followed by indiscriminate British-backed reprisals had been established, leading to ever-greater atrocities. The British Government sent in WW1-hardened troops to assist the overrun Irish Constabulary. These mercenary war veterans were ill-disciplined and regularly counter-attacked non-military Irish businesses. As a result, the whole of Ireland rose up to ensure that British rule over the island was ended once and for all. Wartime events in our locality reached a terrifying peak on the night of 30th September 1920. An IRA Flying Column unit successfully ambushed a police and military patrol on the outskirts of Tubbercurry. The aim of the mission was to kill, wound or capture a recently-appointed Police Inspector, thereby sending out a loud message of local defiance. After a gun battle, the Police Inspector was fatally wounded, and the IRA retreated without suffering any losses. The British reprisal attack was swift and brutal. 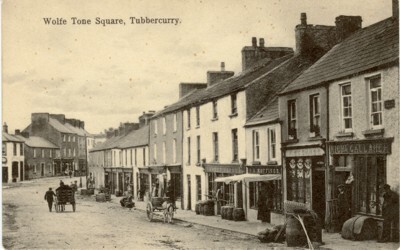 A company of “Black and Tans” entered the once-sleepy town of Tubbercurry and proceeded to burn the shops and homes of suspected IRA sympathizers. As the town was composed of adjoining terraced streets, soon the whole town centre was ablaze with women and children in fear of their lives. A small number of town-based IRA Volunteers could not quell the outrageous violence of an out-of-control British Army. After 30 months of fighting a losing battle, the British called a Truce and political dialogue about Home Rule provisions commenced. Then a short but tragic Civil War broke out as squabbles about the governance of the new Nation got out of control. Peace eventually prevailed in 1922. Local memories are long – but somehow, former enemies were graciously forgiven and Tubbercurry re-emerged from a charred past as though nothing had ever happened. That’s how it is today, and that is why it’s amazing, considering that living witnesses are still around. In genealogy circles, the common term for a seemingly insurmountable research dead-end is a “brick wall.” Professional genealogists have the experience to know that a classic brick wall cannot be scaled – but if you keep digging, and dig deep enough, you might just be able to squeeze part-way through a hole and take a peek at the other side. And what you see might convince you to give up trying to go through that brick wall; it’s pointless. There was nothing of value on the other side. On the other hand, a glimpse of something bright and shiny might inspire you to reverse back a bit, head off to the side (not losing sight of that wall), nudge forward and eventually come out somewhere on the far side of that brick barrier that was holding you back for so long. Then you can start to try and make sense of things in a strange new place, but you can, eventually – if you stick around. My personal brick wall (shown below) is a beautiful thing and pointless. 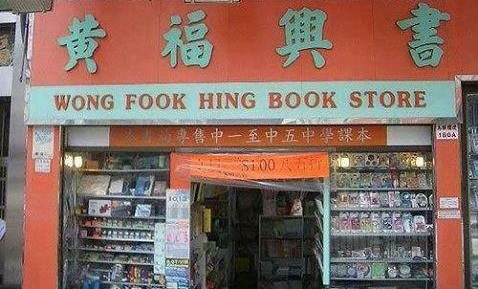 Well, if you look closely enough, you will see that there is no pointing. No mortar. There never was. It’s a work of art; ancient Irish art. 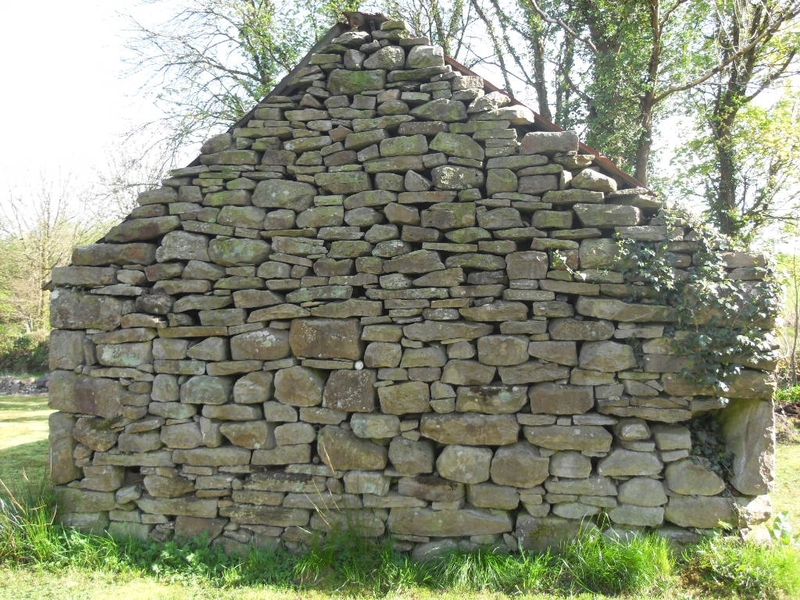 My wall is the gable-end of an ancient Irish stone barn. It has withstood all weathers for over 200 years. It is a State-protected structure, and I am the Protector because it sits on my property. I wish that this meant that the State would contribute to the upkeep of the structure, but no! Oh no – as the private Protector, I am expected to privately raise my own funds and get on with the Protecting without a cent of State assistance. Of course, if my beloved wall ever falls down, then I am in big trouble … with the State – who would not hesitate to prosecute me for trying my best, spending a fortune, but ultimately failing, alone, in my lifelong task.